Pellet stoves are generally low maintenance, which is why we love them! That said, you’ll get the best performance and a longer lifetime out of your stove by carrying out a few of these regular tasks. Here’s what we’ve found to be the best simple maintenance schedule for Pleasant Hearth pellet stove owners. Most of these tasks are easily carried out by you, the homeowner and don’t require a technician. The Pleasant Hearth manufacturers recommend using a heavy-duty vacuum cleaner for cleaning duties, but we think that you’ll be fine using a household vacuum cleaner as long as you empty it regularly and prepared to pick up any extra chunky debris with your hands. You’ll also get the best performance from your pellet stove by using high-performance fuel instead of low-quality fuel. You’ll find that if you use a higher quality fuel, you’ll have a cleaner burn. This means less buildup and deposits in your firepot and less cleaning. A fuel can mean that you’ll need to clean your firepot at least once a day, if not more. “Dirty” fuel that has more dirt and ash can cause “clinkers” to form – these form when that dirt or ash residue is overheated and turns glass-like and solidifies. Cleaner, high-quality fuels also give off less vapor and are therefore a better option for the environment. Make sure your pellet stove is completely shut down and cooled, with the exhaust blower off. You don’t need to unplug if you’re just cleaning the firepot. Open the front door and lift out the firepot. We like to put down an old towel or cloth to rest your firepot on to reduce mess while you’re cleaning. Break up the deposits inside the firepot with your firepot cleanout tool and dispose of your deposits in an approved container. For easy cleaning, access take off the front door of the firepot. You can use the narrow end of the tool to clean out the holes. Tip* You’ll find that a higher quality fuel will result in less deposits and easier cleaning all-round. While you have the firepot out, check the area underneath it for debris and give it a clean. If you removed the door, reassemble the firepot and slide it back into place in the firepot riser. Make sure you have the slanted lip toward the rear – if you don’t install this correctly you’ll likely cause missed ignitions when you try to start your Pleasant Hearth pellet stove. At least weekly, every time the exhaust path is cleaned. Make sure your Pleasant Hearth pellet stove is completely cool before starting. Using a vacuum cleaner, vacuum out the firebox on all sides, including top and bottom. Regular, frequent clearing away of ash here will help to avoid build-up of ash in the vent system and exhaust. Make sure your pleasant hearth pellet stove is totally cool – do not attempt to clean hot glass! Open the door and vacuum away ash from the glass and the door rope. Using a non-abrasive glass cleaner or simply a damp towel, wipe down the glass and then wipe with a dry cloth. 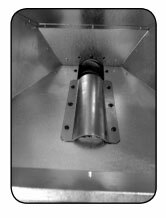 Sawdust build up at the bottom end of the auger can cause issues like shutdowns and missed ignitions, but this is easily prevented by doing a clean of your hopper every month. Make sure your appliance is in complete shutdown, meaning that it has completely run out of pellets and has cooled down. 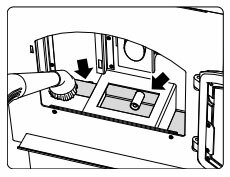 Access the feed tube by removing the auger cover (you’ll need to undo the four screws) inside the hopper. Ensure that the appliance is shut down and completely cool. Open the door and take out the baffles, starting with the center, then right and left baffles. Vacuum the drop tube and exhaust path, front and back of thebaffles, and then do the rest of the firebox. Clean the inside walls of the exhaust box with a small brush – you can access this through the hole inside the firebox which you’ll see after you remove the left baffle. Then you can vacuum out that loose debris and dust. Doing this will help prevent interference with the exhaust temperature probe and annoying shutdowns or missed ignitions. Reassemble by replacing the right and left baffles, then the center baffle. Regularly check the gasket between the firebox and the glass to make sure the seal is still secure. Ensure the pellet stove is shut down, cool, and unplugged, then remove the right side panel. 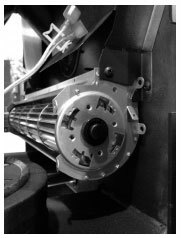 Taking care not to damage the impellers, sweep or vacuum out any build upon them. You may find a soft brush or compressed air handy for loosening dust when doing this task. Make sure the pellet stove is shut down, cool and the exhaust is not blowing, then remove the left side panel. Remove the six screws that hold the exhaust blower motor to the housing. With care not to cause damage to the gasket, remove the motor. Taking care not to bend the fins, vacuum the impellers. Clean the inside of the exhaust outlet with a brush. Reattach the motor. Ensure the wires are attached to the terminals on the blower. You will need to purchase a high-temperature paint, specifically for heating devices for this task. Ensure that your pellet stove is switched off, cooled and unplugged, ready for maintenance. Remove all ash and debris from the firebox and vacuum out thoroughly. Paint all exposed steel, including cast iron.